Arbequina – a mild-bodied extra virgin olive oil with a mature fruitiness and a delicate sweetness of almonds, great for vegetables and seafood. Typically I associate olive with salad dressings and the cooking of meats and pasta dishes, but it actually has a number of applications. For example, have you ever made any desserts using olive oil? I checked out the Pompeian website for a little recipe inspiration, and I was very happy to find some great desserts like Absolutely Outstanding Pound Cake, Banana Cake with Cinnamon Chocolate Swirls, Black Forrest Brownies, and even Chocolate Whoopie Pies! 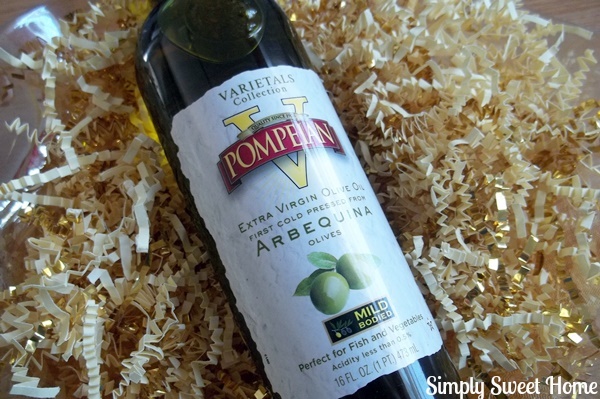 It was great to find some of these traditional favorite recipes, made just a little bit healthier with the help of Pompeian Olive Oil. 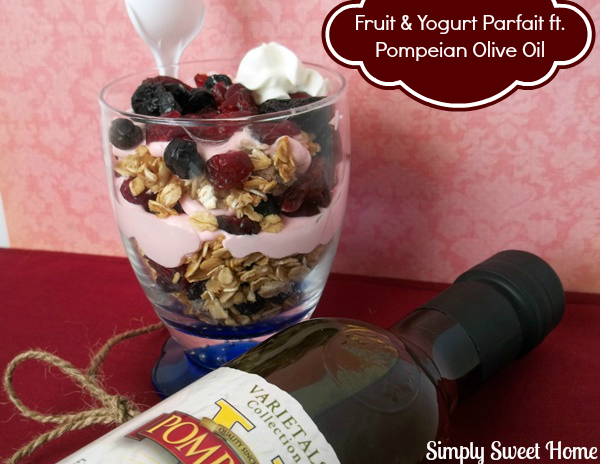 As I set out to write today’s post, I wanted to make a recipe to showcase Pompeian Varietals, and I really wanted to make a dessert, as that is my favorite thing to share. But I also wanted to do something simple. So I chose a fruit and yogurt parfait. I was inspired to create this by an Apple Crisp recipe I found on the Pompeian website. I just took their recipe for the “crisp” and used it for the crumble and then layered it with yogurt, and some dried berries. To make crumble, mix together the whole-wheat flour, rolled oats, flax seeds, light brown sugar, ground cinnamon, salt, almonds, and Pompeian Extra Light Tasting Olive Oil. Spread on to baking dish. Bake at 350 for 5 to 10 minutes, or until lightly toasted. Once cooled, layer crumble with dried fruit and yogurt. (Use as much of the crumble, fruit, and yogurt as you'd like for each one.) Serve and enjoy. So what’s your take on olive oil? What’s you’re favorite dish to cook with it? Looks delicious and healthy. I love yogurt. I can’t wait to try this. Thanks for hosting a great link up! I’m glad I discovered it.